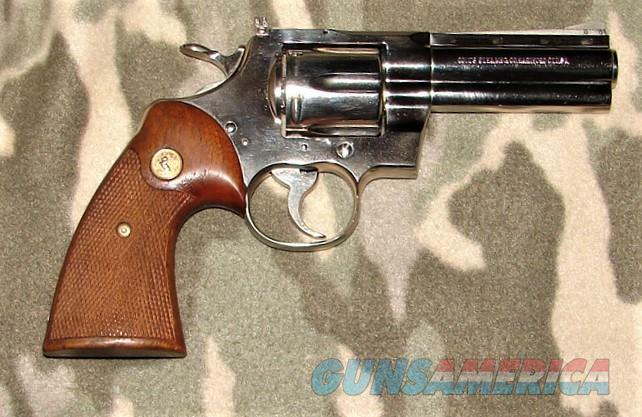 Description: Colt Python .357 Mag. 4” nickel #20289 with an excellent bore. This 1962 manufactured revolver is ANIB retaining all of its original finish showing only very slight scuffing on the top of the frame above the cylinder. The walnut grips are also in excellent condition showing a few small light dents on the bottom of the right stock. Features include an original (I think) styro foam wood grained cardboard box which was not the correct box for this generation Python but it still looks cool. This revolver is as tight as the day it left the factory showing little if any use. Overall this firearm would be the centerpiece of all but the most advanced Python collections.